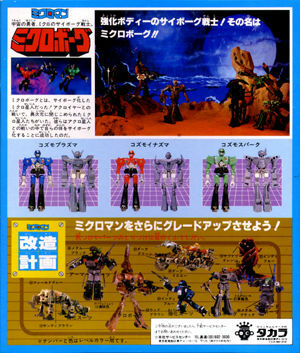 Below is the front and back box art for the Microborg series of figures. 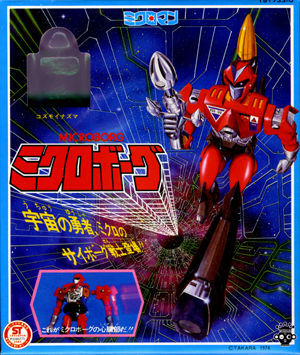 There are three Microborgs; red, green and blue, all of which are shown, with their monochromatic sidekicks, on the back of the box. The three robot compatriots that come with each Microborg are essentially snap model figures that you must assemble yourself. They are made to be built up and painted. The Microborgs and their sidekicks are interchangeable with each other, allowing for various permutations. Each Microborg comes with a silver handgun (as shown on the front box art) and a missile pack that attaches to the back, similar to Boba Fett's, except this one actually fires! The plastic for these figures is somewhat cheaper, but they're still nice figures. Part of the post-80's Microman line.